Streaming platforms come in many shapes and sizes. One of the best we’ve found is Streema: a streaming platform where music lovers can listen to their favourite radio station. Streema has also introduced a mobile app called Simple Radio; this app collects digital stations from around the world, based on genre or location. Broadcast radio is alive and well – the difference is that, compared to the FM giants of yester year, the term ‘broadcast’ has shifted. To make up for the turn of a radio dial, we have to find several savvy ways to make our online radio station discoverable. This includes listing your station on Streema. Jumping on-board, Streema will give your programming a lot of exposure. So, here’s how to add your radio station to Streema in five simple stages. Before approaching Streema, we suggest taking a look at the details of your playlist: the names of artists, songs and albums for every track. Many listeners like having this information in front of them. Streema users sometimes report confusion as to why they can’t see the song info, and you might as well give them the best experience. With SAM Broadcaster, you are able to add your track details manually within your station library. Do a quick double check, though, to see that the track info is 100% present and accounted for. The actual process of uploading to Streema isn’t that clear on Streema’s homepage though. You have to make a detour to their Help Centre (help.streema.com). 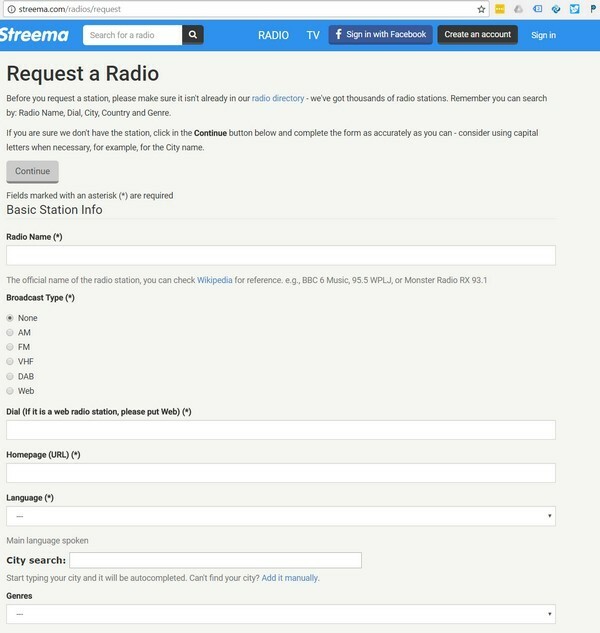 There, select ‘Add a Radio Station to Streema’, and click on the ‘Request a Radio’ link. You will then be taken to a page that will request that you check that the name of your radio station is not already listed in Streema’s current directory. 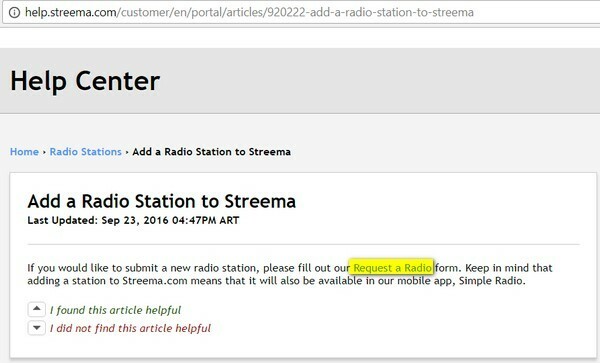 If you are sure that your station is not already registered with Streema, press on continue. When you press continue, you will now be taken to a request form. This is where you must outline the name of your station, the language you’re broadcasting in, and what genres you’re associating with. The latter section can also relate to a theme, such as Brazilian, Travel/Tourism or Sports. Up to four can be selected. At least one streaming URL has to be given; there are options for two additional streams if you have multiple channels or web platforms. The ‘type’ of broadcast is also important, relating to digital streams and/or traditional broadcast methods i.e. Web vs. FM. Within the same form, Streema will ask for your name and email address. This will enable Streema to contact you through via messages if you need to be aware of anything. 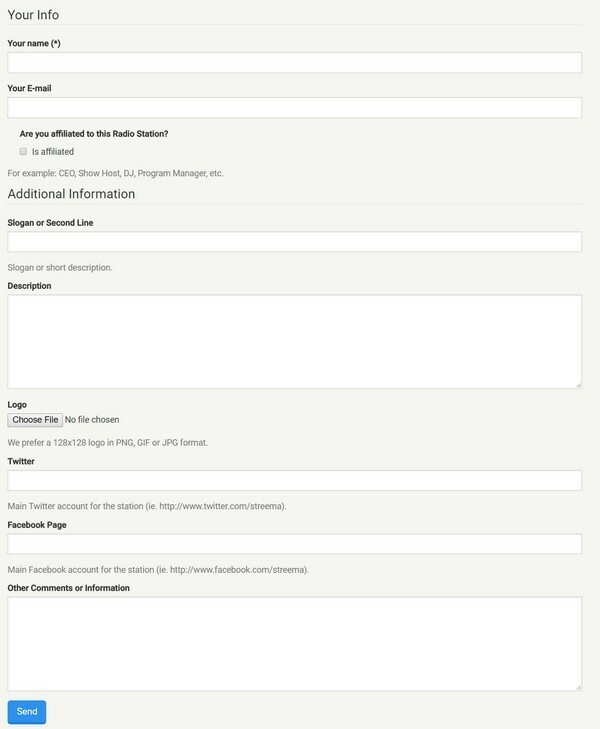 The form also wants to confirm whether you are directly affiliated with the station – producer, radio DJ, presenter etc. – or acting on behalf of someone else (perhaps, say, in an advertising capacity). We’re at the end of the list now… All that’s left is to add the final contextual aspects of your station. Upload your logo from a JPEG, PNG or GIF file, as well as any slogans and descriptions you want to affiliate with the Streema player when it goes live. The Spacial team are a big advocate of social media integration to help boost your exposure even further. Streema has two inputs for Twitter and Facebook addresses, so you can add your social links. Any other comments can be written in the final section of the form, such as a warning for risqué content or days when the station may be taken off-air periodically. Once you have entered and verified you details, you can proceed and click submit on the form. Your details will be submitted to Streema and you will get a confirmation message that says: “Thank you for requesting, we’ll be in touch soon”. It takes 3-5 days for your radio station to be listed on Streema. And that, in a nutshell, is how to add your radio station to Streema. This is a platform that (in more than one sense) gives you access to your favorite internet radio stations.